The railway system in Switzerland is probably the most advanced in the world. The entire system is punctual and modern as a result of financial investment in railway building and locomotive technology. 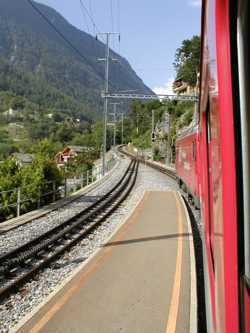 The cities and towns are linked by fast, efficient trains running mainly on a electrified network. On the other hand, the mountain trains rely on a combination of electrified track and modern steam engines. The Swiss have been careful to develop a rail system that is not only extremely efficient but also sensitive to the environment. The photograph opposite shows a modern electricity powered train making its way up the steep track to the summit of the 'Gornergrat'. The train hauls it’s passengers up to a height of 10,000 feet. This is achieved through the use of a rack and pinion track system. On such an incline, using a normal track is not practical as the locomotive would simply slip backwards, down the track. The photograph below shows the typical rack and pinion track system. 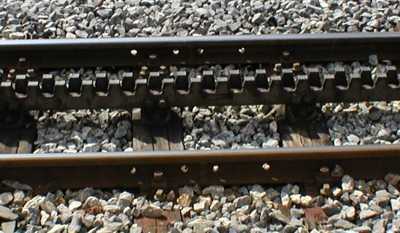 The two outer rails are the same as any normal rail track. However, the centre track has teeth similar to those seen on a gear wheel (this is called the ‘rack’). When the locomotive is required to go up a steep incline a gear wheel (called the ‘pinion’) is lowered from the locomotive engine. This meshes with the rack and pulls the locomotive and carriages up the steep slope. 1. Draw a simplified diagram representing a rack and pinion railway track system. Explain why this type of system is used for tracks on steep inclines. 2. Search the internet for examples throughout the world, of railways that utilise rack and pinion technology.